El Niño has stormed in with great vigor here in Southern California. Cold, cloudy, and intermittently rainy, the predicted weather phenomena is dumping much needed precipitation on the drought-stricken desert land of SoCal and forecasters are promising more to come. Let's hope this rainfall takes care of some of the water problems and Governor Jerry Brown can shut up about it. Of course like any dutiful politician Governor Moonbeam will continue spouting off about something, be it a bullet train or whatever hokum he rattles about in the months to come. The problem with the rain is that now that I'm shaking off my sickness acquired during the holiday break, I'm trying to avoid getting all wet and cold so now I'm waiting for a break in the rain so I can restock our empty pantries after our vacation return. Now that we're home I guess we probably should start eating in again and stop going out for food. I think we need to eat sometimes, but probably don't need to be going to fast food joints or restaurants or wherever. 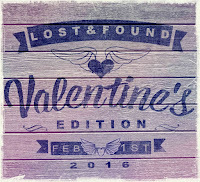 Well, we've got that Lost & Found: Valentine's Edition Blog Hop featuring your special stories and thoughts about the subject of love come and gone. You can click on the preceding link in order to get more info and to sign up. Or you can click on the badge in my sidebar. We're getting good participation so far and I think we're going to get some excellent entries. It happens on February 1st and if you do the Battle of the Bands on that day don't worry: You can combine the two events with a song expressing the topic--so far a few of us will be doing just that. On January 15 I'll be joining in the Backstage Blogathon which will also coincide with a Battle of the Bands post. If you're a film buff you will definitely want to check this out. Click the badge in my sidebar for details. Battle of the Bands! Battle of the Bands! I've already mentioned it twice in this post so I might as well do it again. After all today is the day when the winner of my most recent Battle is to be announced. This Battle was a good one to start the new year--"What's New" was the song and the competing artists were Artie Shaw with Helen Forrest on vocals against the Nelson Riddle Orchestra featuring Linda Ronstadt on vocals. The outcome of this Battle actually surprised me. Since Linda Ronstadt was the more contemporary choice and most likely had the greater name recognition I figured her version to be the shoo-in. Boy, was I off on that forecast! As for my own vote I really wavered on my favorite as I love both of these versions. It's hard to beat that big band sound of Artie Shaw to my ears and Helen Forrest does a splendid job with the vocals. Though some voters found Ronstadt's version to be too slow, boring, and sad, I think she puts a sense of drama depicting a wistful conversational tone to what she is singing which to me is very appropriate for the melancholy sentiment of the song. Nelson Riddle's orchestral arrangement is lush and dripping with sentimentality. I really like what they do with the song. For me it was a tough choice, but in the end I'm going to go with the majority and choose the multifaceted arrangement of Artie Shaw's big band. I hear the audience noise in the background of the recording and realize it was done live. I wish I could go back in time to be there. Great stuff! How's the weather where you are? Do you usually eat home-cooked meals or take-out? Were you surprised about the outcome of this Battle? 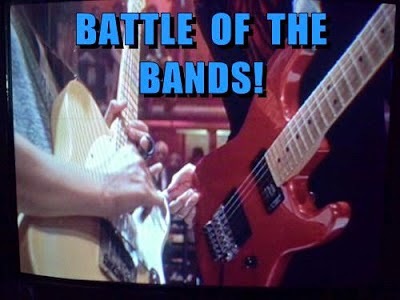 Next Battle of the Bands post will appear on January 15th! Hey, that's next Friday! I was offline that weekend so I missed the battle. Glad you're getting rain. Glad ours finally stopped. I think December's total was close to the equivalent of two hurricanes, although nothing compared to the Midwest. We eat out or get take out once a week. Otherwise, we cook at home. We prefer to control what goes into our food, especially oil. Alex, I wish I had a nutritionally aware in-home cook to fix meals for us. I probably don't cook all that healthy and I'm not real keen on spending a lot of time fixing meals. Nope - not surprised - loved the Artie and Helen version. As to weather - it is -18Centigrade. It is sunny but I wish we'd get more snow. The snow is a bit thin to protect pipes! And plus, houses are warmer when there are good thick drifts around. We don't eat much take out as we live where we'd have to travel for an hour or so to get it! We love to cook. Had Ma Fu Tofu last night - yummy! Jan, the natural insulation of snow is lovely to see though not so much when it's melting into a nasty gray slush. I'm hoping that El Nino will keep us milder and snow free this winter here in the northeast cause I cannot deal with another winter like the last 2, but esp last year. JoJo, I'm not sure how well I'd like cold northeast winters, but I suppose I'd adapt if I had to. I'm glad to you you are bouncing back from your illness. This was a great band battle. (Did Jerry Brown cast his vote for Linda? :) The Linda Ronstadt video was popular on MTV, VH-1 and NBC's Friday Night Videos and we played it often on the MTV station where I worked. I enjoyed it but agree with you that it can't beat that WWII era big band sound. Shady, Linda is probably sick of Moonbeam's crazy pursuits as well. Maybe not though. I'm just getting over a lingering cold. But I did have my flu shot so I have that going for me. And let it rain rain rain (Eric Clapton song). Stephen, rain is great for staying inside and doing stuff like watching movies or being on the computer. Absolute duck weather here as well. It's astonishing to see water in our riverbeds, since they're typically used for off-road activities. I imagine our Snowbirds aren't too happy either, but after La Nina the tantrums of El Nino are much needed. Not surprised about the outcome of your last battle, I really enjoyed it! Diedre, there are grocery stores that do deliver and I'm been considering that idea, but then I might never leave the house. There are plenty of stores very near to my house so shopping isn't really all that big of a deal for me. It is good SoCa is getting rain. Nonstop rain can be dismal. I love to listen to rain. But, this past December's excessive rain was too much for me. I hope you feel better soon. Maybe I should send my mom. She loves to grocery shop. Ann, sunny today! More rain predicted for tomorrow. I'm feeling much much better. As for weather... it's been such a mild winter and then Bam! the cold or wet fell. Or both. We got both here in Florida. It's a bit warmer and dryer today, but that won't last. Frankly, I'm happy to see the cool temps. Winter in the 80s is not winter. Of course, northern folk would say winter in the 50s and 60s isn't winter either, but I LIKE it. I'm not surprised by the outcome of your Battle. Artie Shaw was super! Robin, the older I get, the less I like the colder weather. Then again, when it gets hot, I'm wishing for the cold weather. Just right is what I prefer. This one ended closer than I thought it would, because the last time I looked, ARTIE SHAW seemed to be clobbering Linda. Your vote surprised me here, also. I was pretty sure you'd be leaning Linda's way. Goes to show that every once in awhile "What's New?" is our agreement on a vote. STMcC, I went back and forth on my vote because I preferred both versions. Linda has a lot of fans. Birgit, I prefer meals at home, but I wish someone besides me would fix them and have to clean up after the preparation. Keep feeling better each day & carry a BIG umbrella! Nicki, I need to look for that umbrella. We get so little rain that our umbrellas tend to get tucked out of site during the course of the year. I thought our long spell of rain torrential until I saw your photo. I am going rusty with all this rain. Hope yours don't last long. Yvonne, I don't think the photo was actually from around here, but it looked like this at times. More rain expected tomorrow. Did you make it out today? Looks like a little respite from the rain until tomorrow, although it looks like no rain next week. Yesterday wasn't so bad. But that downpour about 1 AM Thursday morning was quite the deluge. Liz, I did step out of the house a bit on Friday and despite rain predictions for today my wife and I plan on getting out a bit today. Here in Northern Colorado it's cold and snowy. We rarely eat out in a restaurant unless we're celebrating a special event or on vacation. Home-cooked is healthier. Patricia, home-cooked can be healthier, but maybe not the way I sometimes fix things. I'm glad you're feeling better, Lee. It's good that you're finally getting some much-needed rain, but the sun is bound to return soon. Southern California has the best climate! We like to eat out, but don't go as often now, for economical as well as dietary reasons. January is always strict around here, after the holiday indulgences, with the exception of a birthday dinner towards the end of the month. Looking forward to getting back to BOTB on the 15th! Debbie, I think I've got a fun and interesting Battle coming up next. But I feel that way about most of my Battles! Your battles are always fun, Lee. ☺ I hope you'll enjoy my "Double Dog Dare You" challenge as well. Some rollicking good fun ahead, eh, Debbie? Lee, I figured Linda would take this - surprise! Still my choice won so I'm happy. I love the big band sound too. Cloudy, grey skies for days, here, though the temperature has been warm. We did go through a week of rain. I keep different teas on hand to warm me up. Ginger is really nice; add some honey instead of sugar. I'll think about the blog events and get back to you. Dixie, I've been drinking chamomille tea with honey and at night I add some brandy sometimes. The tea works well. The "Lost and Found" should be easy to combine with BOTB and maybe you'll get some new voters. Surpisingly it's in the high 30s and raining here in Maine. Last year at this time we were already buried in snow. Note: I am NOT complaining! Don't eat out much. Too expensive. I might if I could afford it but I have a feeling if I did I might start packing on the pounds. MShatch, Depends on what we're eating. IF I'm fixing a meal for just the two of us then it can almost be as expensive as eating it out. But there's usually enough left over for another meal so there's that. I've been thinking to fixing cheap simple things like oatmeal. I'm kind of getting sick of eating. I wasn't surprised by the outcome of this battle. The big band sound is so good and I'm glad to see so many enjoyed it. Hope El Niño doesn't hamper you getting well. It's no fun starting off a new year not feeling well! Get lots of rest tomorrow. After all, it's Sunday! Michele, I'm mostly staying inside and trying to get plenty of rest. Feeling much better now. Congrats on the rain and hopefully it doesn't make you any more sick and you recover soon! Yes, definitely stop eating out! Not only is it crazy expensive, it also is way bad for your health. All that processed junk. I'm thinking on the Lost & Found bloghop. I signed up, but am still unsure what to write about! Madilyn, I'm sure you'll think of a good Lost and Found topic. Buck, I do all the cooking since I stay home while my wife works. I guess that's fair. My meals don't get overly elaborate though and my wife is a somewhat fussy eater. She'd be okay with me fixing beans and rice everyday. I'd get kind of tired of that. #AtoZChallenge Update, but Wait!--There's More! A to Z Time Is Here! What Does "Manhattan" Say To You? What's New? (#BOTB) --Happy New Year!